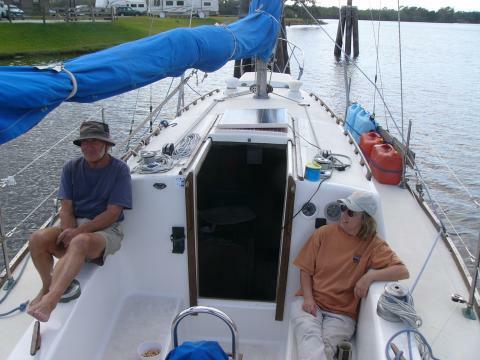 A casual conversation in late fall with an old boating acquaintance from Ariel days at the Alton Coffee shop resulted in a short exploration of the Florida Gulf a week before Christmas. Harry, a retired Canadian with a southern boat was single handing in December while his U.S. boating partner stayed up north to work. Maybe you'd like some crew we suggested. He agreed it would be ok if we should happen to drop in for a short visit. Perhaps to his surprise, two weeks later we had airline reservations to Fort Myers. Harry is nothing if not a good sport. He picked us up at the airport and drove us to Labelle some thirty miles inland where the boat was docked on the Caloosahatchee River. He then parked the Pontiac in storage for five months. Time for him to go cruising. Labelle is on the ICW which cuts across Florida. Inland Florida near Lake Okeechobee is favored among northern cruisers as a lay up spot for their boats during the summer. Here boats stored ashore are less subject to hurricane winds and hazards. 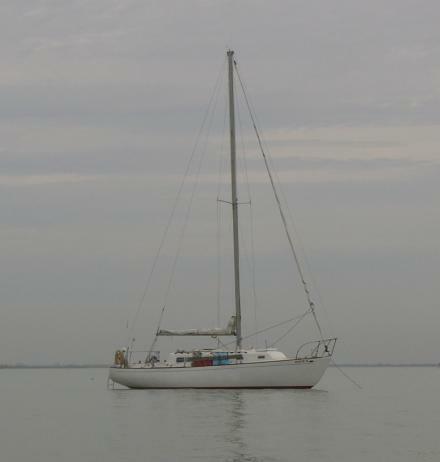 Our host's 35 foot Morgan sloop had survived a powerful and rare inland blow a few months before with nothing more than a lost mast head fly. But now it was time to drive the recently launched Zugfogel down the murky brown river to salt water for a winter of wandering. We walked two blocks under wide spreading live oaks to the grocery and stocked up on cruiser food and shoved off, happy to leave the traffic noise of the Labelle drawbridge beside the town dock. Despite Florida's housing boom there were considerable stretches of natural shoreline and citrus orchard and pastureland along the waterway. At the anchorage by the Franklin lock we saw a resident bald edge (whose nest had been blown away Harry said) and a sea cow. 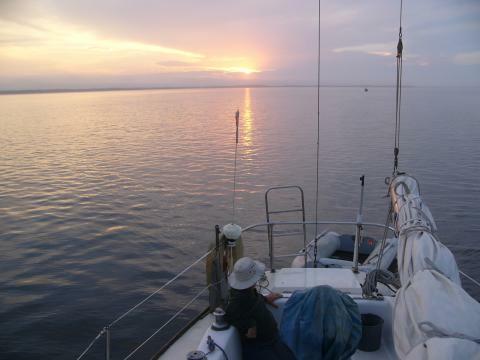 The next day we continued on through the lower Caloosahatchee and under several more draw bridges to the wide but thin waters of Pine Island Sound. Florida's west coast is edged with a series of barrier islands for much of its length. Behind these lie extensive stretches of shoal murky water. Our track followed the ICW channel for about forty miles. (The waterway goes up Florida and then along the Gulf Coast to Texas). 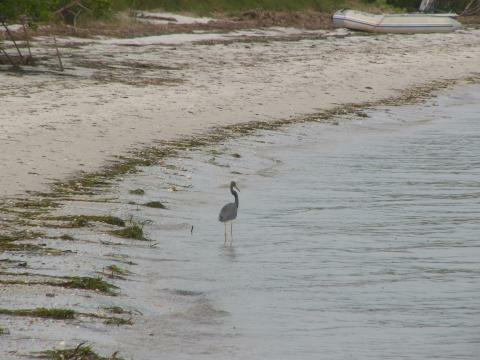 We spent one night behind Sanibel Island, another up north of Captiva Island. Florida is flat. It was for much of our visit warm, almost always humid and sometimes overcast. Its waters were surprisingly empty of boat traffic. Behind the barrier islands Florida's interface between land and sea is a gradual and often ill defined edge. Red mangrove trees colonize shoals that gradually grow into small islands, laced together by the roots of the low growing trees. You can look across five or ten miles of open water mirror smooth and broken here and there by the dozens of little green mangrove islands. And none of it is more than three feet deep or fifteen feet high. We went ashore on one barrier island north of Captiva for a brief walk on a white beach. Here the famed shell beach was much in evidence. We have our lake pebbles, Florida has its shells. Welks and winkles, oysters, and snails, clams and mussels shells lay sometimes in piles a foot deep. 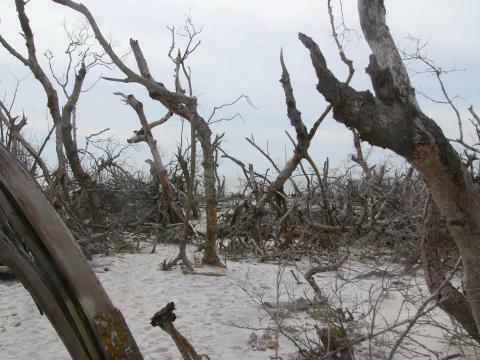 This particular island also showed the impacts of recent hurricane wind and storm surge. The once lush mangrove tangle had been transformed into a ghost forest of silvery gray trunks and limbs. Naked of bark leaves or twigs they stood stripped by the wind reduced to bare weathered wood. Often the low bushy trees had been ripped out of the earth and lay toppled. Yet even here new vegetation sprouted. Vines and shrubs and sapling tees had gained a toe hold to reclaim the desolation. I was surprised in general by the amount of bird and sea life here. 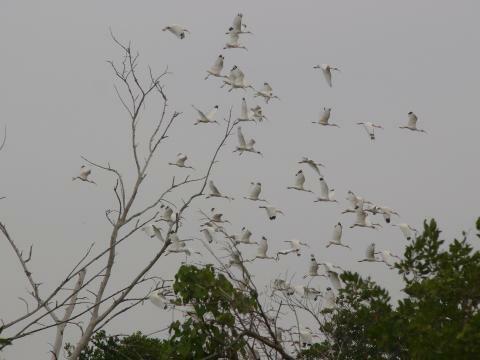 There were the ubiquitous pelicans "ugly birds" as our captain called them and lots of big white wader birds-ibis, egret, heron pretty much indistinguishable to the casual birder. 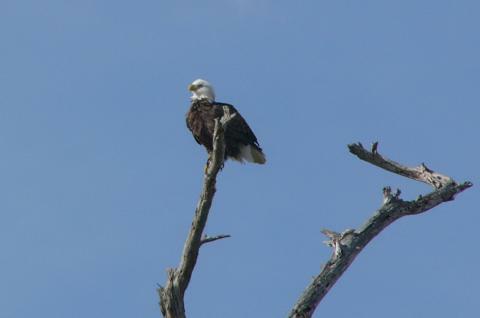 A number of loons were vacationing in the sound and we saw ospreys everywhere. We also saw dolphins close enough sometimes to hear them breathe. A lot of the birds seemed really fearless down here in their vacation land. Must be lots of tourists here, normally. One day we went for a dinghy ride and spotted a wake of some sea creature in the calm water. It was swimming just under the surface. Maybe its a turtle! We shut the motor off and rowed over for a closer look. The creature swam steadily on ignoring us. Is it a sea cow? It looked like a head of some sort. Still it swam and as I rowed closer to it we wondered Boy this thing is really dumb and oblivious. What if it suddenly sees us-will it dive and upset our dinghy? Was it a shark? A giant ray? Nope. It's a crab pot float, just under the surface weaving and bobbing in the tidal current and appearing as a very credible "creature". 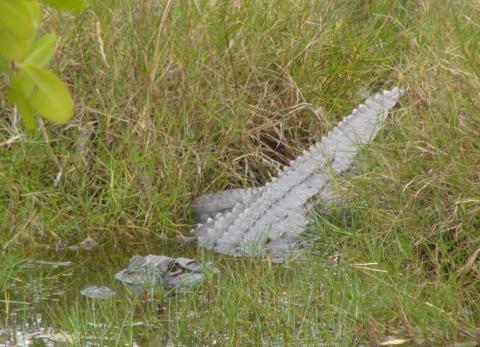 We saw one real "monster" a sizeable gator during a walk at the Ding Darling wildlife refuge. But unless you count the ant lion we tried to feed a luckless ant to on one beach, that was about it for monsters. Yet the dark tangled fetid smelly mangrove swamps with their no see ums sure looked like they should have monsters. On our last day we got out on the gulf for a few hours of sailing. It was cool and drizzling but our cheerful captain agreed to the request for an hour or two of day sailing. With a grand offshore wind of 10 to 20 we had a nice reach in flat water down the coast five or six miles past endless condos and beach houses. Then we headed into the mooring area where we spent the night and got a welcome shower. Fort Myers being home to Florida's largest shrimper fleet, we went off to a shore dinner with Harry and had shrimp. The beach front and eateries were pretty quiet this cool gray December day. Harry explained the "high season" didn't really start until January. We left by taxi the next day to return to the land of snow. Harry was off to Naples and then slowly working down to the keys were he would meet up with his boat partner in January. We had a grand time with him and are very lucky to have Harry and Fran's generous friendship. Now who can we find to invite ourselves aboard for a tropical cruise next year?